If you’re ever driven past or needed one of the 322 Ronald McDonald Houses I’m assuming like me your heart warmed at the iconic clown who provides “a loving home away from home to families needing to be near their seriously ill or injured children while they’re being treated at metropolitan area hospitals.” Based on promotional materials like their own website Ronald McDonald House creates massive goodwill by branding themselves as the corporation who cares for children and their families. Let’s talk about the value of goodwill. In 2012 Mc Donald’s reported its goodwill at $2.8 billion (up from $2.7 billion in 2011) [McDonald’s 2012 Annual Report, page 30]. It would be foolish for us to to shun cause marketing but we still need to look at it with a critical eye. Quite a bit of that goodwill stems from the easily identifiable Ronald McDonald character and the tacit association between Ronald McDonald and healing families is absurd on a good day and offensive on a bad one. If McDonald’s was actually funding these Ronald McDonald Houses I think I’d be able to turn a blind eye. The fact is that they are donating miniscule amounts to the operating budgets of these very important facilities while reaping untold advertising benefits. Fact: Ronald McDonald Houses operate at the local level where they have their own non profit status and have licensing agreements with McDonalds’s for the use of the Ronald McDonald brand. Ken Barun states: We have sort of franchised the charity business. Fact: The Tallahassee Ronald McDonald House told Corporate Accountability International that about 10 percent of their operating budget come from McDonald’s through local fundraisers and donation boxes. Fact: The Dallas RMHC chapter says that only 5% of it’s budget come from both MdDonald’s and RMHC global in 2012. Question: When 90-95% of your funds come from the community you serve why not rebrand as a Community Home? 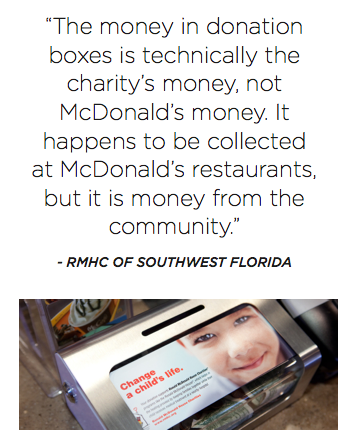 Fact: McDonald’s places RMHC Donation Boxes in some of it’s outlets and makes a big deal of this in much of it’s communication about RMHC. The corporation calls it “our system’s largest ongoing fundraisers,” and boasts that in 2012 more than $50 million was collected worldwide. Fact: In 2012 McDonald’s customers gave 1.5 times more to the RMHC than the corporation itself donated in 2011. Fact: McDonald’s spent at least $18 million on a campaign that would donate one penny of every Happy Meal to the RMHC Foundation. McDonald’s estimated that it might raise $6.4 million. Question: Does this violate the Pledge McDonald’s took to not market junk food to kids? 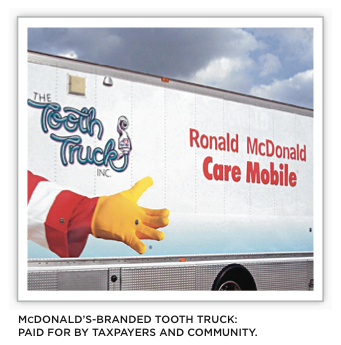 Fact: There is a “Tooth Truck” in the Ozarks that bears the Ronald McDonald image. The annual operating budget of the Ronald McDonald Care Mobile is $600,000 half of which is funded through Missouri Medicaid and the other half comes from community donations. Question: Did the State of Missouri just fund McDonald’s advertising with $300,000? 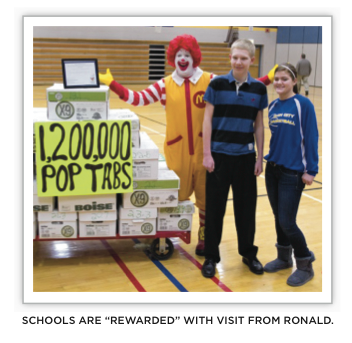 Fact: Schools are rewarded with visits from Ronald McDonald when they collect pop tabs (pull tabs from soda cans). A boy in Sacramento, CA led his classmates in collecting 179 pounds of pop tabs (think about how much soda that is) and generated $12.57 for the Ronald McDonald House of Sacramento. Question: How can anyone take this seriously? Fact: In 2012 the average McDonald’s worker made $8.25 an hour. The CEO was rewarded with an $8.75 million salary not including a 3-year bonus. Fact: A report from the National Employment Law Project found that McDonald’s topped the list of fast food corporations whose workers rely on government assistance programs to make up for low wages. Forbes reported that McDonald’s cost taxpayers $1.2 billion annual in public assistance programs for their low-paid workers. Question: Maybe the Tooth Truck is a $300,000 red herring? Oh nevermind. It all matters. Many organizations no longer accept charitable donations from tobacco corporations and it’s my sincerest hope that the same will soon be said for food corporations with a similarly profound negative impact on public health. I suspect that in 5 or 10 years we’ll look back on Ronald McDonald with the same disbelief as Joe Camel. You can read the full report at StopCorporateAbuse.org. All photos are courtesy of Corporate Accountability International. I did some blogger outreach for the BC (Canadian) RMH and they said that basically their admin costs were covered by McDonalds but the operating costs and efforts to grow (they are opening a bigger house) all comes from local charitable efforts on a far more grass roots level. They rely on McDonalds Canada to help promote the organization but need people to know that they need help far beyond McDonalds. Fantastic post and research JG, sharing now! I do have a question, though I’m not sure either of us will have the answer – I wonder if the local RM houses are able to generate local funds by name dropping the national program, even if they aren’t funded by it. Essentially what I call the “Starbucks” (Or, oddly enough – McDonald’s) effect – Consumer is in an airport or traveling and wants coffee (or a quick lunch), they can shop the local place and perhaps be dazzled but also possibly be very let down so they opt for the Starbucks (or McD) because while it may not be fantastic, they know what they’ll get. Short version – is it easier to fundraise with the name of the clown (since it’s legitimized by a major corp.) rather than as the “Community Helpful Housing Project” which may not pass the sniff test in a cold call / random donation box? Even if that is the case, some additional transparency would definitely be in line. I think about that a lot. I’ve been reading and rereading data and reports from Stop Corporate Abuse endlessly and one of the many tidbits I did not include is that 24 other organizations give $100,000 or more (Coca Cola gives more than $500k and their CEO sits on the non profit board). When we saw a hamburger, coke and fries as a treat this was all probably charming. Now that we have massive corn subsidies, epidemic obesity, and record numbers of children with type 2 diabetes it’s not so charming. Cause marketing is great when the cause and the corporation are after the same goal. This just seems like odd bedfellows (and more than a little deception). Agreed & thanks again for posting this! Nathan–great question. When Michele Simon (report author) was researching it, she spoke with many local charity house employees and volunteers. She heard again and again that it would actually be EASIER to fundraise if McDonald’s wasn’t in their name. That’s because people assume that the houses are fully paid for by McDonald’s, when some get as little as 7% of their funding from the corporation. So without the name, they thought it likely would be easier to fundraise. Interesting – thanks for the intel! Well, I just ate my last Big Mac yesterday. Thanks for the eye opener. Not that I thought they were upstanding or anything, but this grosses me out. Yet Ronald McDonald House does help parents in need, right? I know a couple who’s premature birth has caused quite a number of complications, both for the baby and in their life. I don’t think they’d be able to survive without the help of Ronald McDonald house. I do agree that these statistics are alarming and should be shared. I also think that overall, Ronald McDonald house does good. Gross. Duping consumers about food is one thing, duping them about how you help those in need is another. LOWEST of lows, McD’s. Do you have any idea how much it would cost a charity to purchase the advertising they receive free from the clown? Agreeably the monies collected in donation boxes do not come from McDonald’s own profit margins but if it weren’t for the collection box most of us would probably just keep our coins in our pocket. Personally I am not a fan of McD food but the whiner who wrote this article would likely complain if they were given a winning lottery ticket, because it inconvenienced him to collect the money. Interesting investigative reporting or mud slinging? What has the author done to make a positive financial contribution to this charity and what has the clown done? Remember folks, a rose by any other name. The whiny mudslinging author and people like her will not give to a McDonald’s branded charity but I assure you I give and I give generously to charities with low overheads and clear missions. This is really interesting. I used to volunteer i the local house and I had no clue about this. I do see where the association with McD’s does generate some donations that they might not otherwise receive, but yes I definitely think it is wrong for McD’s to give a misleading impression that they are totally funding the houses. How disappointing! The one thing that I think McDonald’s is doing right and it turns out to be a total scam – ugh! I hate Corporate America – I truly think it is the root of all evil! It’s not the houses themselves that I take issue with because they do some good work. It’s the fact that the credit goes to McDonalds and not to the local donors that provide the overwhelming source of revenue. Any company that spends 18 million on an ad campaign that raised 6.4 million to the RMHC is scamming the public. The facts are clear, plain as day and scream for more investigation and publicity, but there are folks who STILL support McDonalds. I NEVER give to this at the drive through and I think I’ll stop going there altogether. I think I’ll support local mom-and-pop places. Too bad too because, as I said, the RMHC does do some good work. I HOPE that the spare change dropped in the Charity boxes at McD’s ALL gets to the Ronald McDonald House. I eat at McD’s maybe twice a week & every time I put my change in the box & I think to myself that all that loose change at all the McD’s just in 1 day Has to add up to an Incredible Sum. Thank you,Rod Checkalski/WI.